The good news is that PayScale’s report, Inside the Gender Pay Gap, reveals the gap to be smaller in 2016 than in the previous year. PayScale surveyed more than 1.8 million employees to find the difference between median earnings for men and women. Last year, the uncontrolled gap declined to 23.7 percent, and the controlled gap declined to 2.4 percent. That means that women earn about 98 cents on the dollar, when we compare only men and women with similar jobs, experience, supervisory status, etc. The bad news is … that’s where the good news ends. Now, don’t get me wrong: this year’s results are certainly headed in the right direction. That said, any gender pay disparity is ultimately unacceptable. As a recruiter, I’ve had a front-row seat to the effect this inequity can have on a company’s ability to attract and retain top talent. I frequently hear it from female candidates: they’re looking to leave their current employer due to a lack of advancement opportunities — professionally, financially, or both. They’re not wrong, they’re not alone, and the data agree. According to PayScale’s report, 18.5 percent of women surveyed believe they have missed out on a raise, promotion, or both because of their gender. This climbs as high as 35.9 percent in women with an MBA. Only 3.5 percent of all men and 5.3 percent of male MBAs felt they had similarly been passed over. Thankfully, both men and women appear to be recognizing this as an issue more than they ever have before. 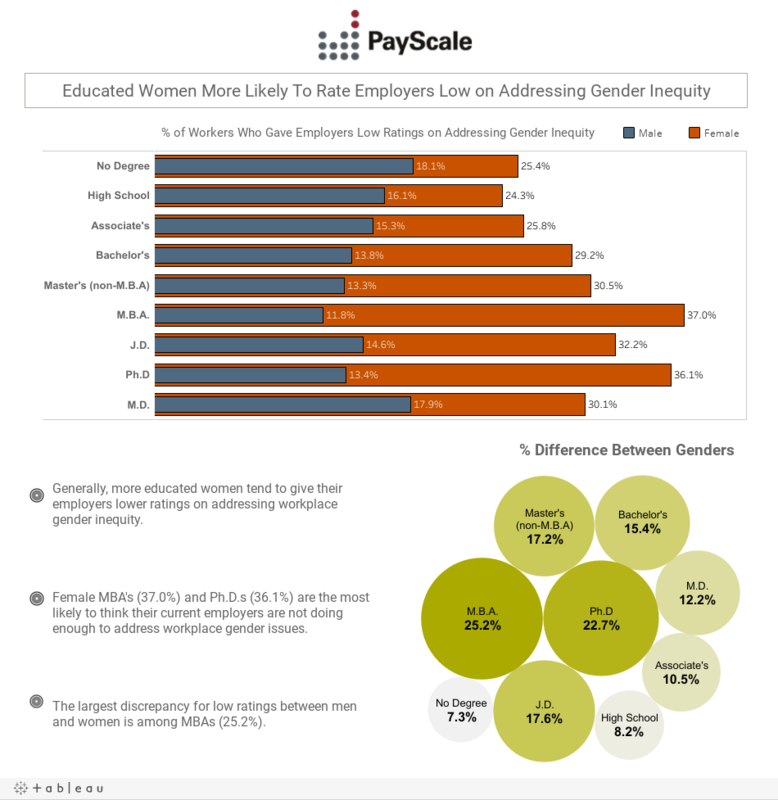 PayScale asked respondents whether gender pay disparity is an issue at their current companies, whether their companies were acting to address the disparity, and whether respondents have any plans to seek new employment within the next six months. Both male and female respondents sent a clear message in their answers: the lower the “employer action rating” with regards to addressing inequity, the more likely that the employee is planning to seek a new job in the next six months. In fact, 73.5 percent of male respondents and 70.6 percent of female respondents who say their employers are taking “no action” plan on actively seeking outside opportunities in the near future. Earlier this year, Facebook announced total pay parity within their company, with their head of HR stating, “I’m proud to share that at Facebook, men and women earn the same.” However, only about 32 percent of Facebook’s 12,000-plus global employees are female. This illustrates well why true pay equity in the workplace cannot be reached without opportunity equity. PayScale’s study shows that mid-career men are 25 percent more likely than mid-career women to be in management roles, and over 41 percent more likely in their late career. Amazon (widely regarded as one of the most sought-after employers in the world) released their gender disparity data, revealing that only 24 percent of Amazon managers, only one out of seven corporate officers, and only three of 11 board members are female. Tech companies can’t claim true gender equity when women are still underrepresented in leadership roles. They can’t even necessarily say that women have as much opportunity to earn those roles as men, because many companies reward behaviors that are coded as masculine. Education can boost pay, but doesn’t close the gender pay gap. By negotiating your salary right now, you can make it easier for other women after you to negotiate their salaries as well. The worst thing you can is to sit back and wait patiently for your company to give you a raise. When it comes to women and their salaries, there is no good karma and there are no easy wins — especially when it comes to the gender pay gap. Instead, take PayScale’s free “What am I worth?” survey. You’ll learn what you’re worth in the marketplace based on your compensable factors and not your gender. A happy side effect? Contributing your data to more reports like Inside the Gender Pay Gap. Has your gender affected your pay and opportunities at work? We want to hear from you. Share your thoughts in the comments or join the conversation on Twitter.